I really liked the way this came out and it is a quick and easy way to give a gift. For our design team projects this week for The Cutting Cafe, we got to work with clear cardstock, which is something that is carried in the new sister store The Cutting Cafe Shop. 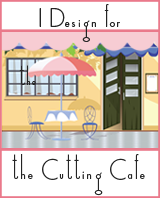 Be sure to stop by The Cutting Cafe Blog on the 7th and 21st of each month when Design Team projects are posted. Leave a comment and you will be entered into a drawing to win three files of your choice! Before you leave, here is my video which explains what I did. Thanks for stopping by! This time for our design team project for The Cutting Cafe, we could choose any file we wanted to. However, we had to use the color green. Since spring is coming and so is St. Patrick’s Day, green is very appropriate! I had gift cards to give to staff for Employee Appreciation Day and wanted a cute and easy way to give them. So I used the Gift Card and Money Holder Set. Be sure to stop by The Cutting Cafe Blog and see all of the design team projects. There will be plenty of variety for inspiration! Leave a comment and you will be eligible to win three free files in a drawing on the next posting. I also wanted to give another person at work a thank you gift card for his extra effort to get some projects done for me. So I made a different one for him.